This reel is one of many that were named for young women. The practice was common in the nineteenth century when all the music that was played, and all the music that had ever been played, was played by living breathing human beings. Though there was the occasional concert, music was most commonly heard in parlors, in pubs, and on porches. Everyday music had to be played in these more intimate settings, as the only way to increase volume was to either hoist them above the fray or add additional players. The sense of privacy back then had more expansive aspects than today, though admittedly it was in other aspects more truncated. The lack of first names was a way to protect her, though it was also a way for her to pretend not to know it was named for her. Naming a tune after a young woman was an indication of your intention, and it was a good intention if she was pleased, and a bad one if she wasn’t. 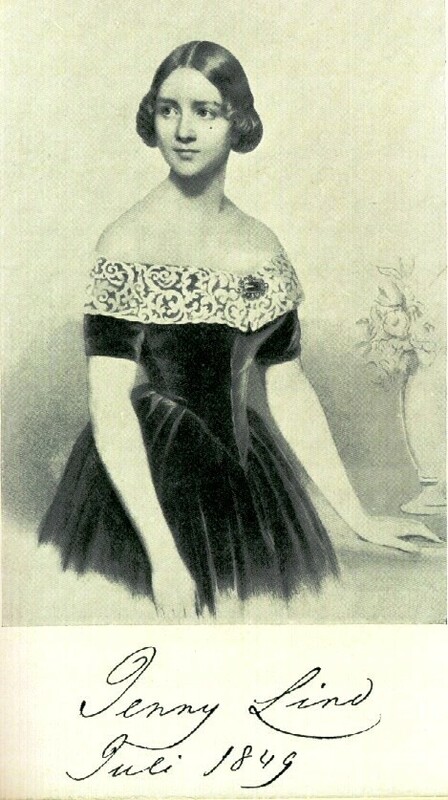 Jenny Lind, prior to her U.S. debut. Still, you didn’t want to do it too often, nor would she want many tunes named after her, as both had untoward implications. You’d also have to know her well enough as for some young women having a tune named after you was itself objectionable as it meant all sorts of people would be talking about you in parlors, in pubs, and on porches. And note that it wasn’t until 1850 that a woman’s face was used in advertising, and it was by Phineas T. Barnum advertising Jenny Lind, the “Swedish Nightingale” — and she was met by 30,000 spectators when her ship arrived in the States. The resultant association with circus acts made it objectionable for a woman to have her likeness used, so that advertisers had to create fictitious young women to advertise their goods for quite some time afterward. This article was posted in ABC format, Dots, Irish Tunes, MP3, Reel, Slow Session, Tune, Tune Comment, Very Popular and tagged ABC format, Irish Reels, Irish Session, Irish Traditional Music, Learning Irish Music, Recordings of Irish Music, Session Tunes, Teaching Irish Music, Tune History. Bookmark the permalink. Follow comments with the RSS feed for this post.Post a Comment or leave a trackback: Trackback URL.